Ah, the good old days when great cartoons didn't look like Pokemon rip-offs. 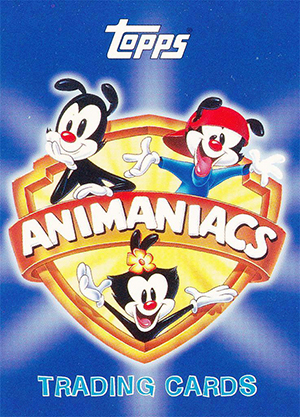 Animaniacs ranks as one of the top shows of the 1990s, bringing updated zany humor in the tradition of Bugs Bunny and the Looney Tunes gang. 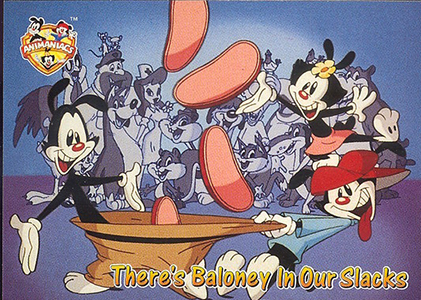 A similar style of humor carries over to 1995 Topps Animaniacs trading cards. It's a simple set that showcases the show's humor. The base set has 72 cards, which is broken down into several subsets, most of which are character-focused. Not surprisingly, Yakko, Wakko and Dot get the most attention. Pinky, the Brain, the Goodfeathers and Chicken Boo are among the other memorable faces in the base set. Card fronts take images from the show with short write-ups on the back. Every pack includes one of 12 different foil stickers. These capture characters at their most memorable moments. Because they're relatively easy to find, these are sometimes packaged with base sets on the secondary market. 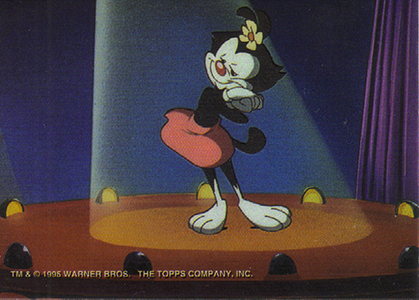 The only other insert set in 1995 Topps Animaniacs are four Vinyl Mini-Cels. These are inserted 1:18 packs. 1995 Topps Animaniacs boxes have 36 packs of eight cards plus one sticker. 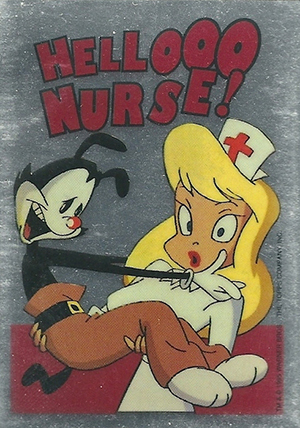 1995 Topps Animaniacs Vinyl Mini-Cel #3 Dot Non-Sports Card Warner Bros.
47 Okay Lady, Love Ya! Bye-Bye! 53 Lean On Me, Pal! 58 We're Big Boned, Not Fat! 64 Cartoons don't just happen, you know. 12 cards. Inserted 1 per pack. 4 cards. Inserted 1:18 packs.